The threat of rain caused the various arena judging sessions to be brought forward, though it never actually materialised leaving a cloudy but dry day. The SCCCC club stand featured nine cars, with two other members either without transport or otherwise engaged. Considering we didn't think we"d have enough cars for a stand at all earlier in the year, this was pretty good going. Let"s hope we can keep it up next year. A very busy combined stand for the Droopsnoot Group and Viva Drivers Club, not helped by having a combined total of 28 passes between the two clubs, and a stand with barely enough room for 20 cars. 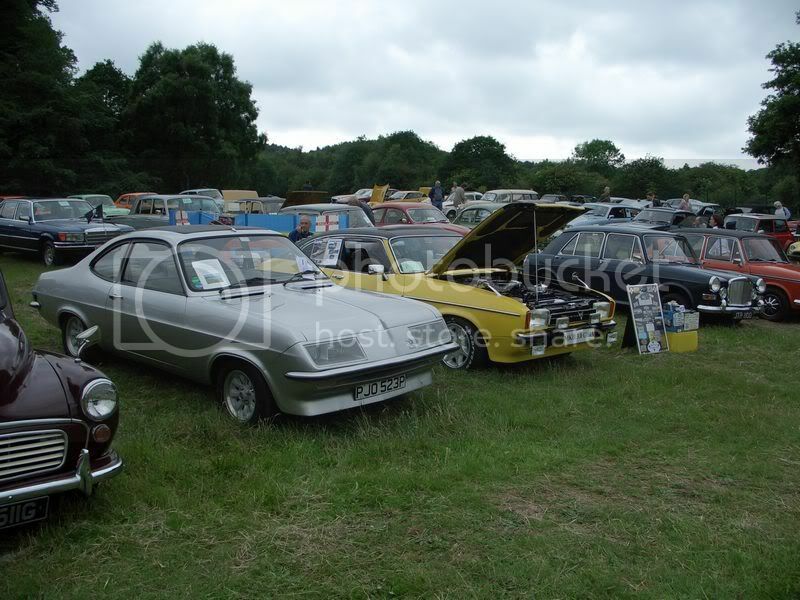 Luckily the neighbouring Ford Anglia club had space to spare and allowed us to annexe part of their stand for Sunday. A grey day for this one, but a good turnout nonetheless. I was in the individual entries section this year, although they had written my local car club name, the South Cheshire Collectors Car Club, on the pass, there didn't appear to be an allocated stand. A few showers dampened things down a bit, but they soon went off. Very sunny all weekend, it was good to be up in the trees at the back of the showground. A mixed stand contained three HPFs and a Chevette HSR replica from the DSG, along with a selection of Vivas from the Viva Drivers Club, Opel Mantas and Monzas, Victors and more. Combining the various Vauxhall clubs worked out quite well, if a little cramped, but if everyone who had a ticket had come to the show it would have been way too small for all the cars. The static part of the show (the part I entered) was a little small, and I initially wondered whether it was just because it was the first run. Then I got word that between seventy and eighty cars were on the run (the "Wander" part, to Chirk Castle and back) and when they came back to the showground it got much busier. A wide range of vehicles took place, ranging from a pre-war Speedwagon coach to a modern Aston Martin, Audi quattros, Jaguar XKs, and virtually everything between. And the sun came out towards the end of the day. Better weather today, no rain at all but still a little cloudy. For the first time I was an individual entry rather than as part of a club stand, general club stands seemed to be down in numbers overall. A pretty good autojumble and a chance to catch up with people I haven't seen since the shows last year made this a good day out. A lovely setting for this show, rain early in the morning spoiled the outlook for the day a little but it soon dried off and stayed dry if cloudy for the rest of the day. The cars are arranged around the front of the house, on the hill and in the lower field at the back of the house. A wide range of vehicles showed up, including large club displays from the Rolls-Royce Enthusiasts Club and the local branch of the Porsche Club.